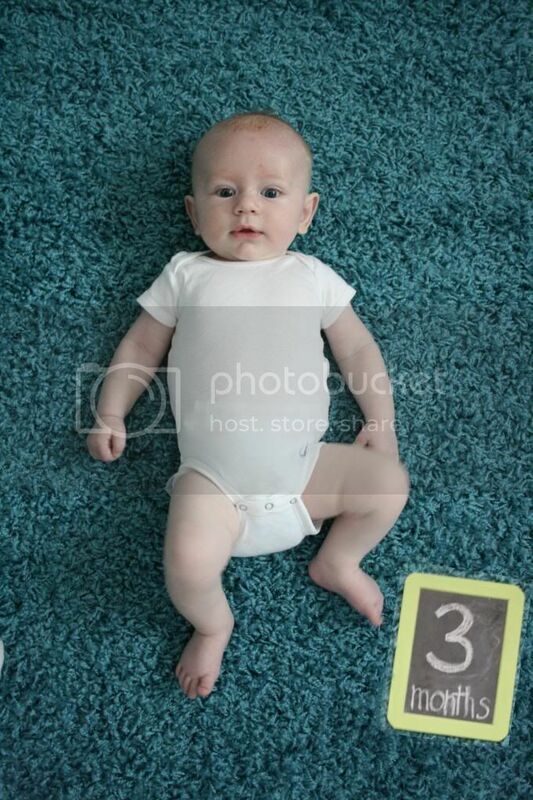 Jordy Liz Blogs: Dear Liam, You are three months old. Dear Liam, You are three months old. You are three months old today. This last month - your third month - has been my absolute favorite so far. At eight and nine weeks, you started settling into a great routine. You would eat every three hours, play for about an hour, and take a nap until it was time to eat again. You also dropped one of your night feedings, which left us only having to get up once in the middle of the night around 3 a.m.
At ten weeks, you found your thumb! That same night, you slept ten hours straight. It was incredible. For the first time in three months, I got more than three hours of sleep. Since then, you've been sleeping anywhere from nine to eleven hours a night, and we are so okay with that. At eleven and twelve weeks, you turned into a little boy all of a sudden. You find yourself in the mirror and give big grins to the little boy looking back at you. You pull yourself up to sitting position with the help of holding onto my thumbs, and then immediately stand straight up. You can't stand sitting still anymore now that you know this trick. You're smiling and talking and moving around. As soon as you see me peek over your crib in the morning, you get a huge smile on your face and start kicking your legs and flailing your arms. You're much more of a morning person than I am. Your routine is still going strong. You've become so predictable and are an overall content baby. You only cry when you're hungry (and I don't blame you) and fuss a little when you're tired (again, I don't blame you). In between, you're content just looking around and being loved on. Bath time is still your favorite time of the day and you enjoy kicking and splashing in the water. As soon as you hear the faucet running, you grow quiet and start to smile. Knowing how much you love baths, we took you for a swim the other weekend. You were so relaxed to just sit back in your float and hang out in the water. That might be the only way we'll be able to beat the heat this summer. Your second favorite time of the day is the morning when you catch an episode of Little Einsteins. You squeal and kick at the show; it's so fun to watch. You also started day care this last week. While I was hesitant at first, you have done so great. The teachers say you never cry and you enjoy sitting back and watching all of the other babies. You are so content when I pick you up and it makes my mama heart happy and settled. So like I said, this last month has been a joy. Your routine is down. You're sleeping like a champ. You're fun to be around and you make our days brighter. I can't wait to see you grow even more.